Rich flood plains with abundant grasses greeted the first white men who saw the area. They later returned to settle on the lands they were granted and to found significant families. 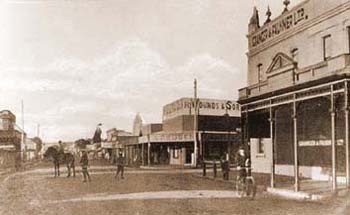 The town of Singleton takes its name from original settler, Benjamin Singleton, who with John Howe, was the first white man to thoroughly explore the area in 1819 and 1820. When they reached the site of the present-day Whittingham Railway Station (a few kilometres south of where Singleton stands today), they decided that this was where a new town should be laid out. This was on 17th March 1820, which was on St Patricks Day, and the area is still known as Patrick's Plains. See Early Expeditions. This exploration opened the way for the pioneer settlers who followed, bringing their flocks and herds over the rough track across the Bulga Mountains from Windsor and Richmond, to establish the beginnings of a pastoral industry in the Upper Hunter. Singleton, Howe and other members of the exploring party - Phillip Thorley, Thomas Dargin, Andrew and George Loder - received grants from the government in recognition of their services. In the late 1820s, Singleton took up his grant where the town now stands, and built a flour mill. George Loder called his nearby property “Abbey Green” and later established a meat preserving works there. Bullock teams, visitors to the area, and settlers, appeared to bypass the official settlement at Whittingham, and would make their camp on the nearby river banks on Singleton's grant. Over a period, various services were established nearby, and in 1835 a survey was made, which paved the way for the establishment of Singleton as a town at that location, instead of at the original location planned. 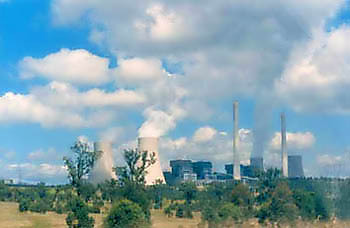 Bayswater Power Station between Singleton & Muswellbrook. In the 1820’s some of the colony’s wealthy settlers chose the Singleton area in which to make their home. One of these was Dr George Bowman, who took up some thousands of acres named “Ravensworth”, and appointed John Larnach as his overseer in 1823. Henry Dangar took up his land on the southern side of the present town, and called it “Neotsfield”, while the Glennie family settled at the Glennie’s Creek area near Falbrook. James Mudie was granted 4,150 acres in 1822, also south of Singleton, which he called “Castle Forbes” (after his patron Sir Charles Forbes). 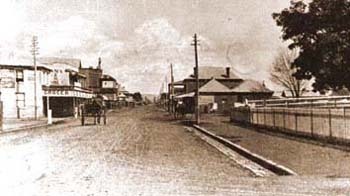 Then in 1825, John Larnach (with his earnings from Bowman) established “Rosemount” in 1825, where “Baroona” now stands. He subsequently married Mudie’s daughter Emily in 1827. In 1833 Mudie and Larnach fell into disrepute over maltreatment of their assigned convicts, and methods used in quashing a revolt. This led to the hanging of 5 men, and brought public attention to the whole system of convict labour. The pair left the area with their families, and later Henry Dangar’s son Albert took over their properties. Dangar undertook extensive building work, and turned “Rosemount” into the show-piece castle it is today. Singleton remains one of the oldest towns in Australia, and the first settled in the Upper Hunter, with its rich river flats and attractive surrounds. Tobacco was once grown extensively in the Hunter Valley District until the late 19th Century, with the produce carried by teams of bullock wagons to the tobacco factory at Singleton. When the railway arrived in 1863, it brought prosperity to the town, with bullock teams bringing wool down from the northern interior for trans-shipment to Morpeth. It then went by steamer to Sydney, and sometimes more than 50 bullock teams would be waiting at the stores to load goods for the return journey. These days, the vineyards, horse studs, coal mines, dairy farms and agricultural pursuits all contribute to the wealth and history of the region. Singleton is situated on the banks of the Hunter River, 209 km north-west of Sydney via Cessnock, and still has a number of wonderful old buildings in the town. It also has lots of new ones - particularly on the northern side - as it is a steadily growing area, and this can be seen in the population increase from 9,572 in 1981, to about 20,500 in 1997. The principal sources of income are dairying, beef cattle, wineries, vegetable growing, coalmining, power generation, tourism, commerce and the large army base. There are 18 coalmining operations in the shire, which employed 4,000 people and produced 46 million tonnes of coal in 1996 (40 percent of the state’s output). Most of the mines are open-cut, while seventy per cent of the total is exported, and some is used for local power generation. Dairying is also significant, and one-quarter of the Hunter Valley's milk production comes from this area. There are also wineries at the historic village of Broke, and very comfortable tourist accommodation is also available. The resorts at Pokolbin and delightful Lake St Clair are also not far away.